As school holidays and Easter time are upon us, we’re in disbelief that it’s already the end of April! This realisation that the year is flying by has made us think about why we do what we do. Living the Winemaker dream is a lot of sweat and tears, but it’s also the perfect opportunity to create something to bring people together and enjoy this wonderful thing we call life, and we wouldn’t have it any other way. For us; Emma and Stevo, making great wine is about bringing people together with great food, awesome company, and sensational wines! Just like ours! Wink, wink, nudge, nudge. But seriously, that is why we do what we do and why we love it so much. Because life, laughter, and enjoying great produce is made all the better by sharing it with people. 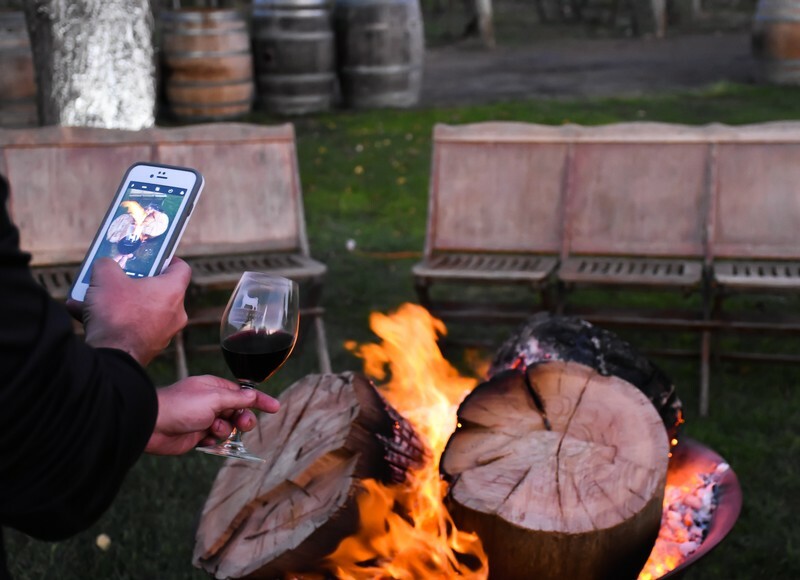 We have many events at Raidis Estate throughout the year, and we love nothing more than bringing people together and chatting all things wine, food, and good times. This month alone we have already enjoyed the Big Sky banquet as part of Tasting Australia, Chris’s charcoal grill, and we are heading toward our Living the dream event for another year. These events revolve around getting to know our community; those who love our wines, and we have a fun time whilst doing it. Of course, these events introduce new people to our wines too and make our community bigger. And on top of the events, many lovers of our wines also become our friends. We wish you a happy and safe break, shared with family and friends and surrounded by great food and great wine because for us no holiday period is complete without some great friends and of course Raidis Estate’s finest. 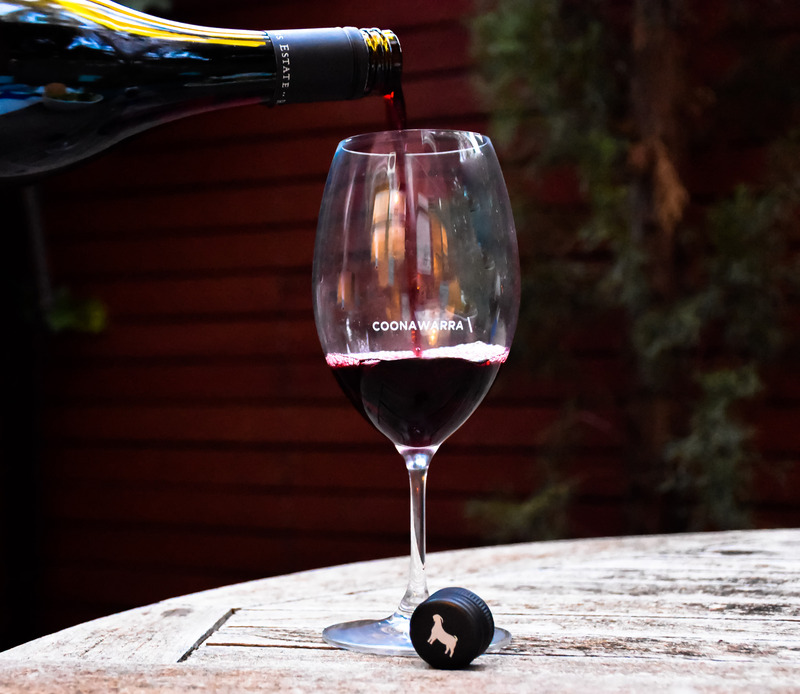 Life is short and is there to be enjoyed, and if you happen to be in the Coonawarra this holiday period, be sure to swing by and say hello. We will be more than happy to give you a guided tasting through our beautiful range of wines. With Easter just around the corner, we felt it only fair to help you out with that Sunday morning treat that you’re sure to indulge in, and that pairs perfectly with loads of butter, a cup of tea, or even a cheeky glass of vino. We are talking about hot cross buns! An Easter tradition in many households, and oh so good when you take the time to bake them yourself. Combine flour, yeast, sugar, mixed spice, salt and currants in a large bowl. Melt butter in a small saucepan over medium heat. Add milk. Heat for 1 minute, or until lukewarm. Add warm milk mixture and eggs to currant mixture. Use a flat-bladed knife to mix until dough almost comes together. Use clean hands to finish mixing to form a soft dough. Turn dough out onto a floured surface. Knead for 10 minutes, or until dough is smooth. Place into a lightly oiled bowl. Cover with plastic wrap. Set aside in a warm, draught-free place for 1 to 1 1/2 hours, or until dough doubles in size. Line a large baking tray with non-stick baking paper. Punch dough down to its original size. Knead for 30 seconds on a lightly floured surface until smooth. Divide into 12 even portions. Shape each portion into a ball. Place balls onto lined tray, about 1cm apart. Cover with plastic wrap. Set aside in a warm, draught-free place for 30 minutes, or until buns double in size. Preheat oven to 190°C or 170˚C fan-force. Make flour paste: Mix flour and water together in a small bowl until smooth, adding a little more water if paste is too thick. Spoon into a small snap-lock bag. Snip off 1 corner of bag. Pipe flour paste over tops of buns to form crosses. Bake for 20 to 25 minutes, or until buns are cooked through. Make glaze: Place water and sugar into a small saucepan over low heat. Stir until sugar dissolves. Bring to the boil. Boil for 3-4 minutes. Brush warm glaze over warm hot cross buns. Serve warm or at room temperature. These are best eaten straight from the oven but can be frozen. But who are we kidding, you will likely not have any leftovers! Easter always provides the perfect opportunity to hit the open road, leave the hustle and bustle of city life behind, and explore Australia. And with Easter this year falling so close to the school holidays, there are plenty of chances to pack the kids in the car and head off on a trip to make a lifelong memory. It always blows our minds how many South Aussies and Victorians have never been to the Coonawarra for a weekend getaway or an extended stay. So, if you are still yet to book a trip away for this Easter, why not head toward our beautiful patch of the world and give it a go. Here are some exciting things happening in our region this April. There are some amazing opportunities to dabble your toe in the wonderful world of camping, whilst not having to do so without all the amenities your heart desires. We have options popping up to do just that all over the South East. 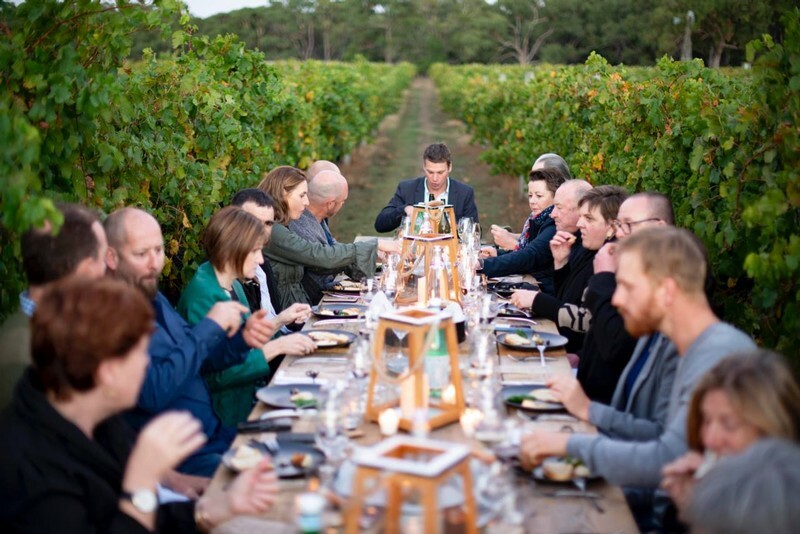 Places such Bellweather Wines in the heart of the Coonawarra offer glamping accommodation, Sea Vu Caravan Park in the gorgeous seaside town of Robe, and also companies that offer a pop-up and pitch like Luxe Glamping in Mount Gambier. Our South East region holds its own when it comes to incredible places to visit and options to explore for the food and beverage lovers at heart. 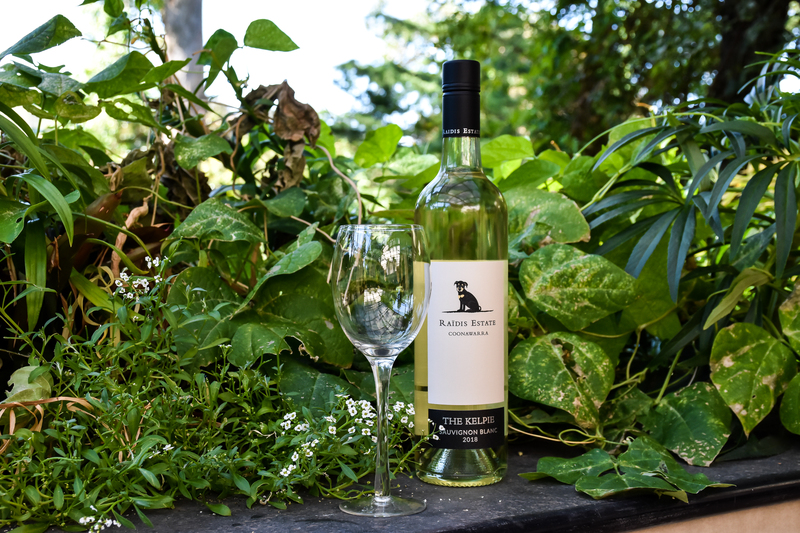 There are brewery options such as Robe Town Brewery, wine bars and festivals in Mount Gambier, and wine regions like the Coonawarra – hint, hint, nudge, nudge, along with other amazing producers popping up all around the place. 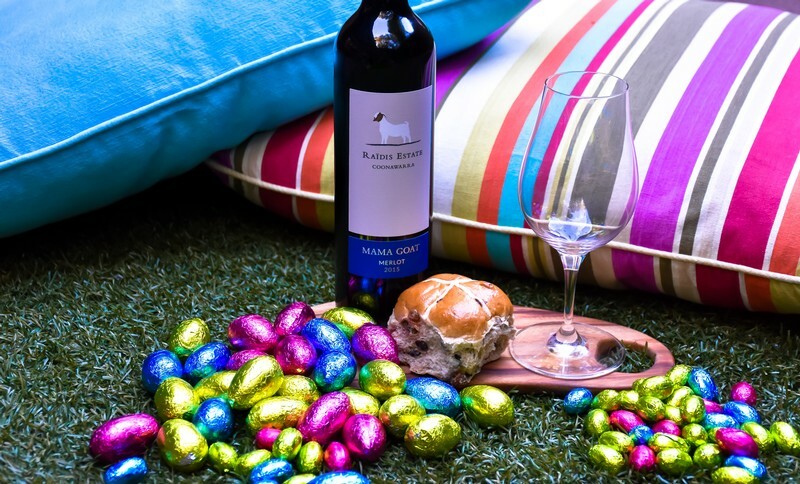 And this Easter Friday we will have food, wines, and fun times at our place in the Coonawarra. We are talking about the blue lake. If you have never seen this natural marvel it’s a must-visit for the family travellers and Instagrammers at heart. It's big, beautiful and oh so blue, so be sure to bring your camera. We have some of the most amazing beaches to explore, go 4x4 driving on, and to just relax such as Beachport, Robe, and Kingston, and the beauty is they are all close to the Coonawarra too. This is just a little taste to whet your appetite, but our region has so many incredible things to do and places to see, and should definitely be on the list of places to visit this Easter. We strongly suggest that if you are on that post-Mad March summer indulgence diet of soups and salads this is not the story for you…. But on the other hand, if you are keen for a little indulgence and comfort food this Autumn, you’ve come to the right place! There is something awesomely delicious about the simplicity of a grilled cheese sandwich. 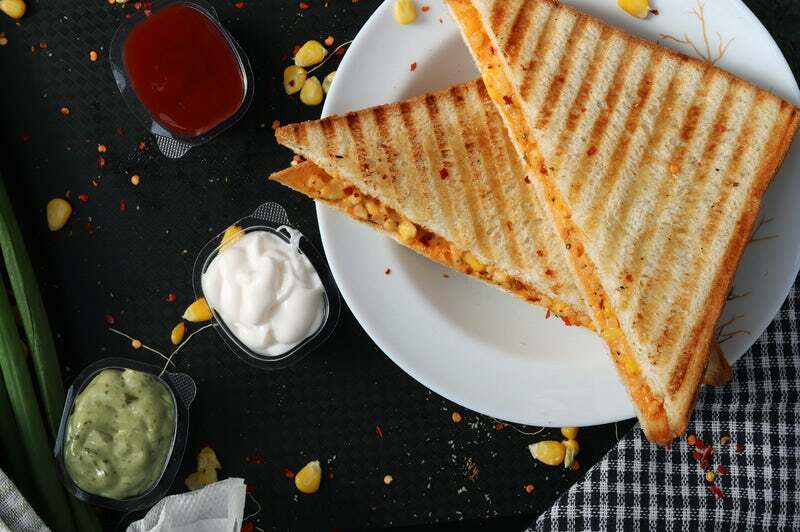 Whether you are a traditional wack it in a jaffle, grilled in the oven or flat press kind of sandwich lover, we probably all have fun toastie memories of grilled cheese dinners, late night escapades after a night out, or just when you can’t be bothered to cook. So, in the spirit of recognising these humble and simply delicious offerings, we are taking it next level and recommending our top five “next level” toasties. Just like its name, and as simple as a traditional grilled cheese this little delight is loaded with butter, the kind of white bread your gym trainer would smack you for, and gooey delicious mac and cheese. Perfect for a rainy day, nursing a sore head or let’s face it, for kids who don’t need to worry about the calories. Ingredients – Cheese, Mac and Cheese mix, Butter and that white bread your personal trainer frowns upon. Take it to the next level – Add three different types of cheese – hallelujah! Perfect for leftover spaghetti bolognaise, pasta bake, potato bake, you name it. If it fits in a jaffle then away you go. Take it to the next level - Add in some delicious cheese like Jarlsberg or something with an equally fancy name! This one is a little bit fancier; maybe for date night, or just for a rainy afternoon inside watching movies. Ingredients – Pick three of your favourite cheeses - possibly a cheddar, a goat’s cheese, and a pecorino might go well, add a little spinach and some fancy-pants bread and away you go. Now we’ve got your attention! This one is going to be a winner, and ladies, it may just be the way to a man’s heart. Ingredients – Bacon, cheese, onion, pickles, mustard. Can I get a hell yes?! Take it to the next level – This bacon goodness can only be paired perfectly with some type of fancy craft brew. Yes, we said it… A dessert toastie! Ingredients – Fresh raspberries, mascarpone cheese spread, and some dark chocolate. Take it to the next level – Add a port, dessert wine, a lively Cabernet, or anything really. Delish! Living life as a grape grown from vines on a patch of red earth in the Coonawarra is a good way to live. There is plenty of water, care, and comfort. Come March and April, life takes a dramatic turn for Billy grape 1.1. The once tranquil vineyard starts to become a hive of activity as all the growing and ripening comes to fruition. He’s looking mighty fine if he does say so himself. He is big, full and juicy. And, what starts out as living the dream for a Billy grape is all about to change dramatically, like it or not. As people flood through the vines and start clipping and picking at the Billy grapes, popping them into buckets, and then into bins, the journey starts for the little Billy grape from vine to wine. He’s been hearing about this day for a long time and now that it’s here he’s a bit apprehensive about what comes next. And just like that, his turn comes around as a sweet blonde-haired lady with one neat snip cuts him and his bunch of fellow Billy grapes from the vine. Once all packed tightly with his brothers and sisters in the bins, they are popped onto a truck and sent on a little journey to a nearby winery. It’s here where things get interesting. The little Billy grapes are put into big machines, squashed and mashed and left to sit for several days whilst the colour of their skins merges with the juices flowing out of them, and their sugary insides turn into alcohol. Talk about getting close to your brothers and sisters, they are now intimately combined. It sounds a little rough, but Billy 1.1 knows that it’s his destiny, and together they make a beautiful deep crimson colour that can only be made by coming together. After several days of stewing in their own juices so to speak, the little Billy grapes are put into another machine where all the skins are pushed to the side and just the crimson liquid flows effortlessly out. If you were to ask that little Billy grape what he thinks of this process, he would say this is what I’m destined to be… So, I’m ok with this transformation. After ageing away with his brothers and sisters in oak barrel homes, they are tested and split up into bottles. It’s from now on that Billy really gets to shine as he’s shipped all over Australia and the world to appear on dining room tables, pulled out for special occasions, and placed on shelves in wine stores ready to be picked up, opened and enjoyed. We know that’s just how he likes it so if you see little Billy 1.1 and his brothers and sisters on your table, say hi from us. Autumn is upon us and as the days go from hot to temperate, we start thinking about delicious recipes for warming and nourishing, especially on the back of cool mornings in the vineyards at vintage. 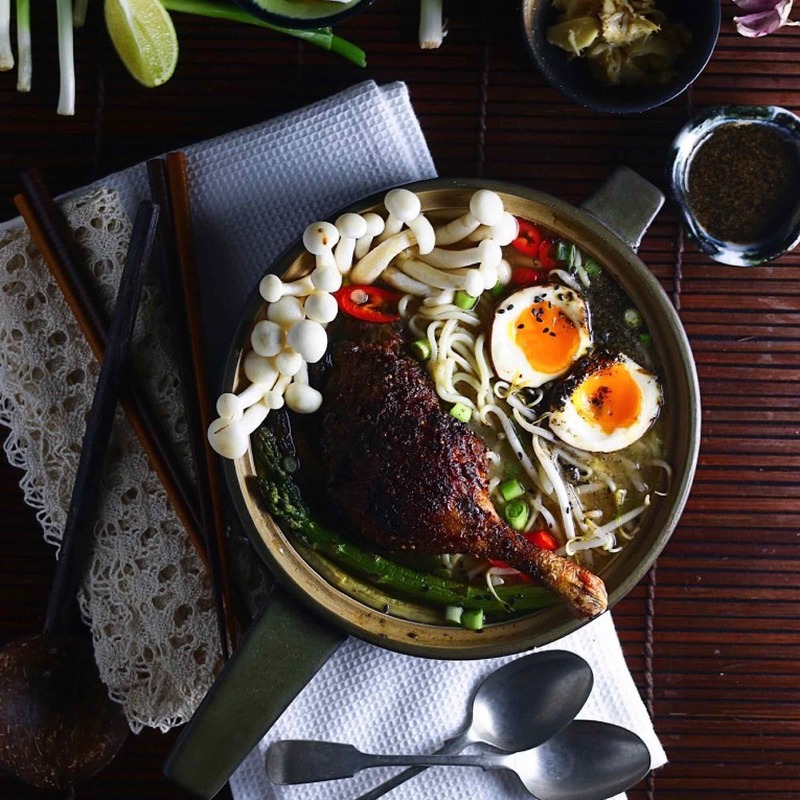 There is nothing better than a big bowl of ramen soup to warm you up. 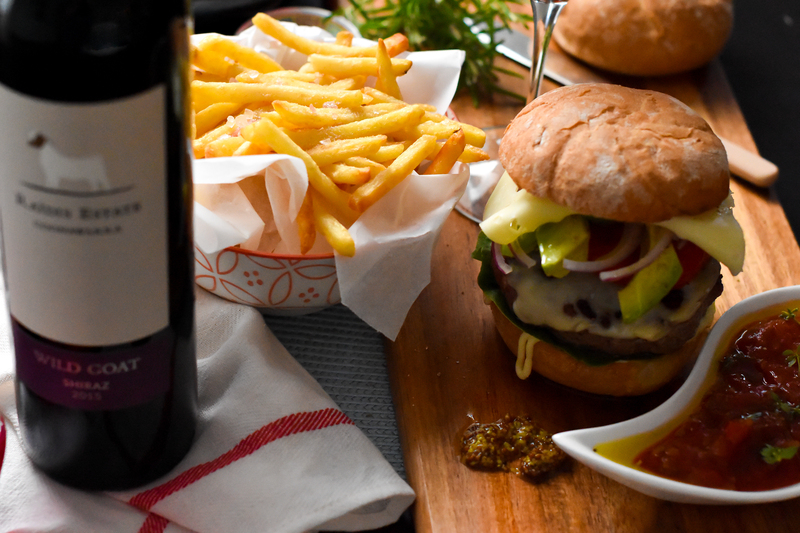 One to make when you have a bit of free time on a Sunday arvo, or a lazy Friday night, this recipe is sure to delight. And, it will pair perfectly with our smooth and delicious Mama Goat Merlot. Preheat the oven to 180c. Put the duck carcass, garlic, thyme, shallot, onion, carrot, and celery in a roasting pan. Roast, turning every now and then, until well-browned all over; about one hour. Transfer the contents of the roasting pan to a large stock pot. Pour off any rendered duck fat and reserve. Add the bay leaf, parsley, and 10 cups of water to the stockpot. Bring to a boil and then immediately reduce to a simmer. Cook, skimming and discarding any foam that floats to the top, for two hours. Cool slightly and strain. Season with salt and pepper. Refrigerate overnight. The next day, remove from the refrigerator and remove the layer of fat that has accumulated on top. Slice off the very bottom of the lemongrass stalks and the tops of the lemongrass, so that you have 3-4″ pieces. Peel off any dried-out layers. Slice the lemongrass in half lengthwise. Slightly bash the lemongrass with a rolling pin to help release some of its aromatic oils. Pour the duck stock into a pot. Add the lemongrass, ginger, and star anise. Heat until warmed through. Add the toppings. Combine the minced shallot, garlic, sesame seeds, salt, and oil in a small pot. Set over low heat. Slowly cook, stirring periodically until the garlic has softened and lightly browned; 5-6 minutes. Turn off the heat and add the Togarashi. Stir. Let sit for a few hours or overnight. There are so many fun facts about wine; it’s uses, it’s drinkers and what people do when they drink too much (which we won’t go into). And, there are also a lot of fun facts that are worth knowing, even if it’s just for a trivia night. So how many of these did you know before? The oldest preserved bottle of wine is nearly 1700 years old and it is on display in a German museum. That’s one hell of an old wine! I wonder if it will ever be opened? Rumour has it putting ice and salt in a bucket will chill white wine or Champagne faster. We are yet to try this but if you know the answer, we’d love to hear it! True or false? – Do you pronounce the “t” in Moët & Chandon Champagne? Potentially depends on how upper crust you are. Prince Charles has an Aston Martin that runs on biofuel made out of wine. Completely useless fact but interesting nonetheless. According to the Wine Institute, Vatican City drinks the most wine per capita in Europe at 74 litres of wine per person per year. That's a full two times more wine per capita than Italy. Clearly ‘Holy water’! A red wine glass should have an edge that's angled slightly inward. Supposedly to make it easier to smell the wine's aromas. 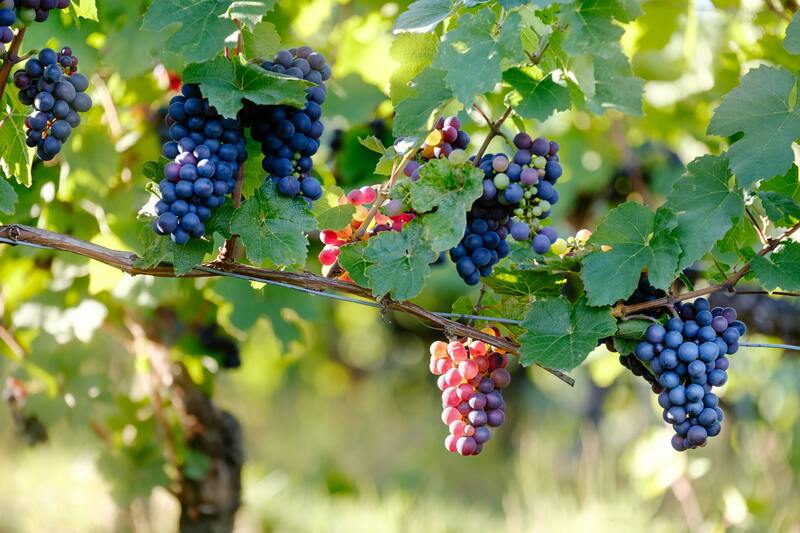 Australia has some of the oldest grape vines in the World. True story. An experiment was conducted in 2001 with 54 undergraduates who were studying wine tasting and winemaking at the University of Bordeaux. The researcher asked them to describe one glass of white wine and one glass of red wine. They didn't know that the glass of red wine was actually white wine dyed red. Not one of the 54 students realized they were drinking white wine. Yep, we are with you when everyone groans when they see hot cross buns in the supermarket weeks after Christmas… I mean come on now! But the truth is that every year, Easter does tend to creep up on us. And yep we hate to say it, but Easter is coming up real fast. Hello March! So this is just a little reminder, a gentle nudge to stock up on your favourite Raidis Estate drops. We have some new vintages in some of our reds, and they make either the perfect Easter gift for friends, to take to a shack with you for a family visit or just for yourself. You don’t even have to share them. The kids get all the chocolate treats so why not treat yourself. 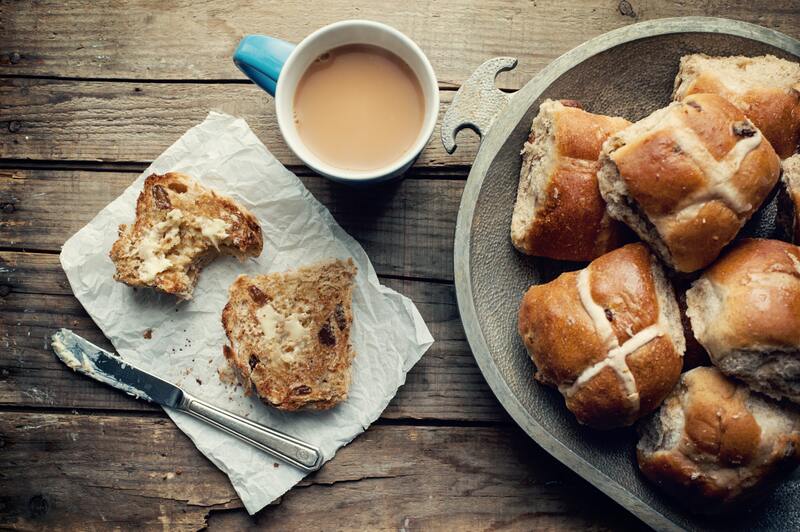 Oh and also here’s a delicious recipe for hot cross buns as well if that’s more your style. 1. Preheat oven to 180°c. Lightly grease an oven tray. 2. Place milk and butter in a saucepan over gentle heat and stir until butter has melted. Remove from heat and cool to lukewarm. 3. Meanwhile, combine flour, yeast, sugar, spices, baking powder, bicarb soda, lemon rind, dried fruit and a pinch of salt in a mixing bowl. Lightly whisk eggs and vanilla together and add to dry ingredients. Use a wooden spoon to gently stir in the milk and butter mixture until the dough comes together. 4. Turn out dough onto a clean surface and knead for 10 minutes. Place dough in a lightly oiled bowl, cover with plastic wrap and place in a warm spot for 11/2 hours or until doubled in size. 5. Turn out risen dough onto a clean surface and, using your hands, knead it back to its original size. 6. Form dough into 12 evenly shaped buns. Place buns onto prepared tray and loosely cover with plastic wrap, leaving enough room for the buns to rise. Allow 30 minutes for them to rise again. 7. To make flour paste, mix flour and water together to form a smooth paste and spoon in a piping bag. Pipe a cross on top of each risen bun, then bake for 15 minutes or until golden. 8. Meanwhile, to make the glaze, mix golden syrup with 1/4 cup boiling water. Brush over cooked buns while they are still hot. Serve while warm.